Chapter President: Nicholson, David G, Sr. 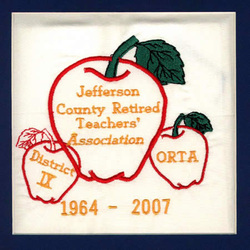 The Jefferson County Retired Teachers held their organizational meeting on August 18, 1964 at the home of Mrs. Elsie Hannan. The charter members were Ruby Bailie, Florence Bucey, B. L. Brommer, Clemmie Burris, Merrill Dennis, Pauline Everson, W. I. Everson, Margaret Evans, Willella Fleming, Octa Foster and Blanche Francy. Officers elected at this meeting were President Clyde Sutherland, Vice-President Elsie Hannan and Secretary/Treasurer Gladys Kracer. Mrs. Alverna Baer and Mrs. Alma Zinninger of Canton briefed the group on the functions of the organizaiton. Dues were established at $1.00 per year. Meetings are held four times per year at various area churches. Programs vary according to the needs and interests of the members.